276 lots of historical letters and documents will be up for bids at University Archives' March 27th sale. 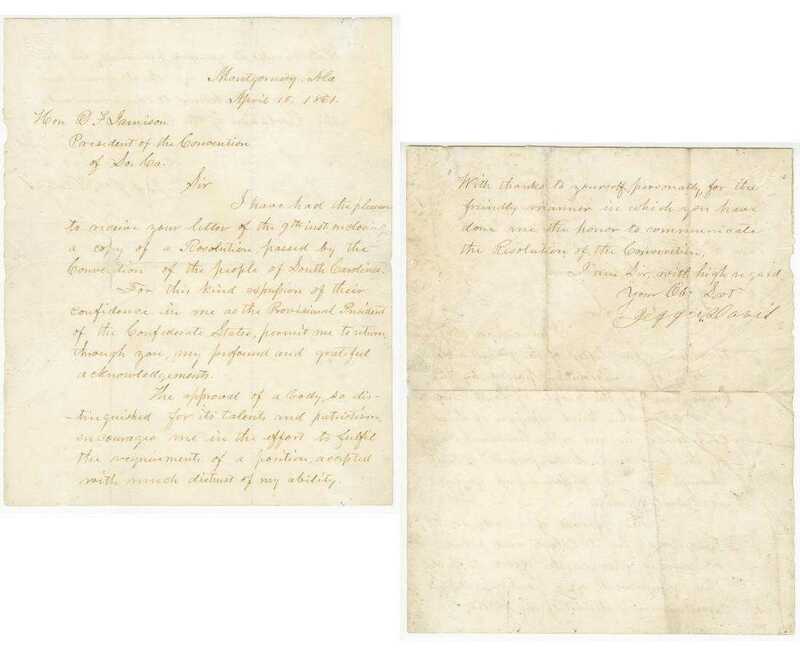 Historically important letters handwritten and signed by U.S. President Thomas Jefferson, Confederate States President Jefferson Davis and legendary frontiersman Davy Crockett, plus a rare patent assignment document signed by Albert Einstein, will be featured in University Archives’ next online-only auction, slated for Wednesday, March 27th. Thomas Jefferson one-page letter, signed “Th. Jefferson” and dated Jan. 8, 1801, in which he references the nephew of his concubine and slave, Sally Hemings (est. $35,000-$45,000). The Thomas Jefferson one-page letter, signed “Th. 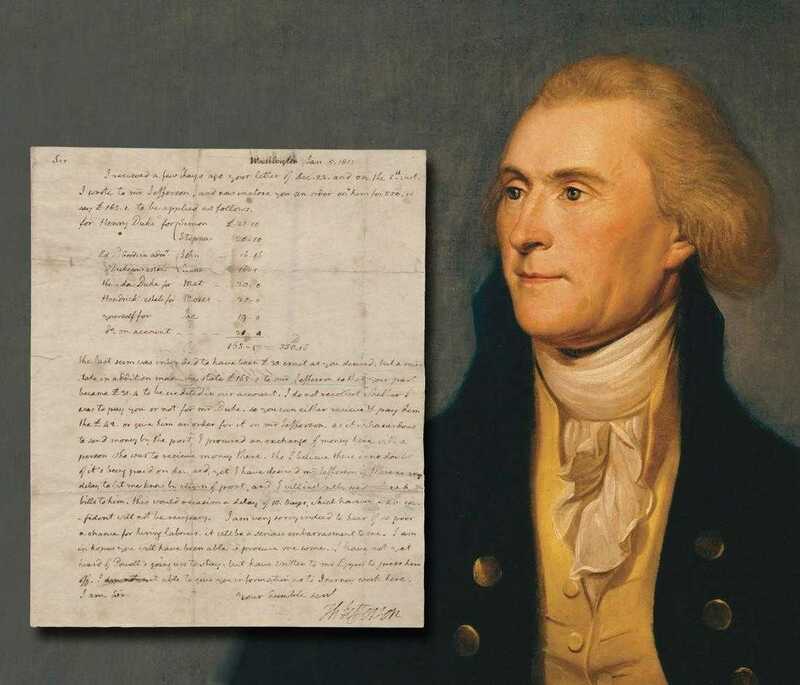 Jefferson” and dated Jan. 8, 1801, when he was Vice President and President-elect, was addressed to Richard Robinson, Jefferson’s assistant overseer at Monticello, Jefferson’s estate home in Virginia. He writes about needing help in reassembling and erecting the columns for the home’s east portico and, in doing so, references the nephew of his concubine and slave, Sally Hemings. The letter should bring $35,000-$45,000. Historically significant Jefferson Davis acceptance letter as the Provisional President of the Confederate States, signed (“Jeffn Davis”) and dated (“April 18, 1861”), (est. $30,000-$35,000). The Jefferson Davis letter is historically significant in that it is Davis’s acceptance letter as the Provisional President of the Confederate States. Signed (“Jeffn Davis”) and dated (“April 18, 1861”), at the outbreak of the Civil War, the letter is addressed to D.F. Jamison, president of the South Carolina Convention. In it, Davis humbly promises to fulfill his duties as the president, a position he would assume in November of 1861. The letter is estimated to hit $30,000-$35,000. One-page Davy Crockett letter, signed (“David Crockett”) and dated (“5 May 1830”), a fine if somewhat frantic letter, full of misspells and largely void of punctuation (est. $30,000-$35,000). 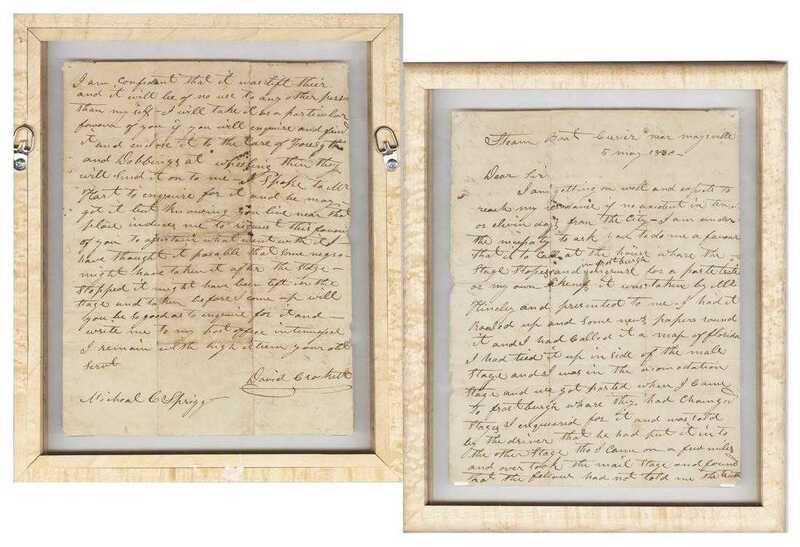 Also expected to reach $30,000-$35,000 is the one-page Davy Crockett letter, signed (“David Crockett”) and dated (“5 May 1830”). It’s a fine if somewhat frantic letter, full of misspells and largely devoid of punctuation. Heading home from Washington, Crockett had reached Maysville, Kentucky when he realized he’d lost a portrait of himself after leaving Frostburg, Maryland. He enlisted the help of Michael Sprigg of Maryland, a fellow legislator in the 20th / 21st Congresses. Albert Einstein patent assignment document signed by Einstein and touching on his Nobel Prize-winning work on the photo-electric effect, for an automatic camera (est. $20,000-$24,000). 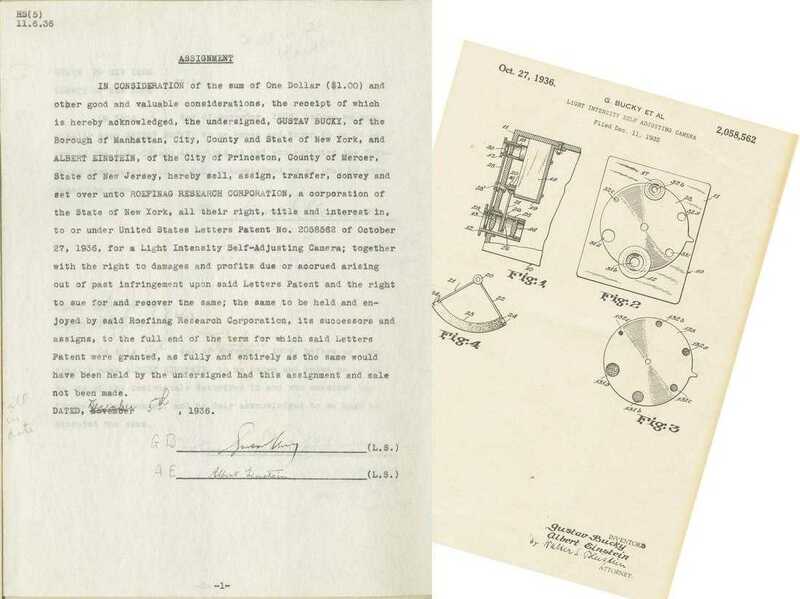 The Albert Einstein offering isn’t a letter but perhaps something even better: a patent assignment document signed by Einstein and touching on his Nobel Prize-winning work on the photo-electric effect. His colleague, Gustav Bucky, also signed the typewritten, two-page document. The patent was for a “Light Intensity Self-Adjusting Camera”, an automatic camera developed five years before Kodak’s Super-Six 20. The rare document should command $20,000-$24,000. 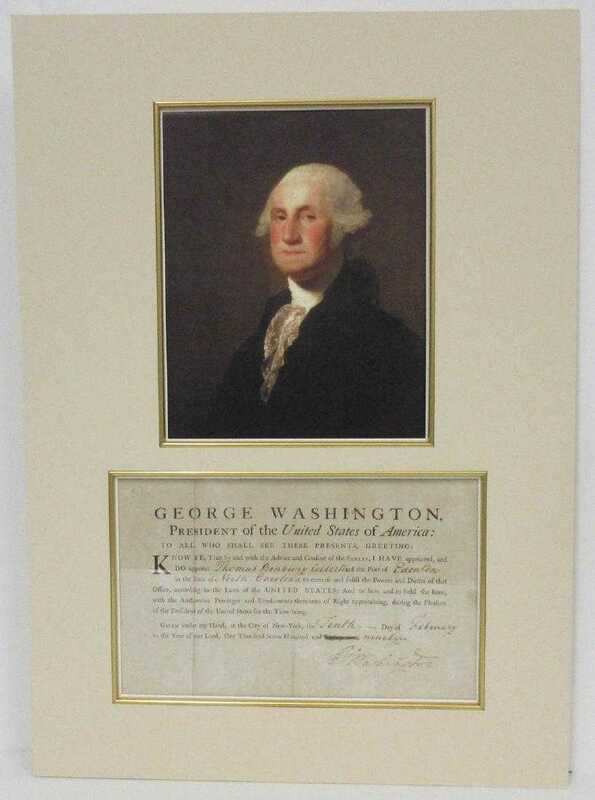 George Washington document, signed as President, dated Feb. 10, 1790, in which he appoints a port collector for North Carolina, matted, with a portrait of Washington (est. $18,000-$20,000). 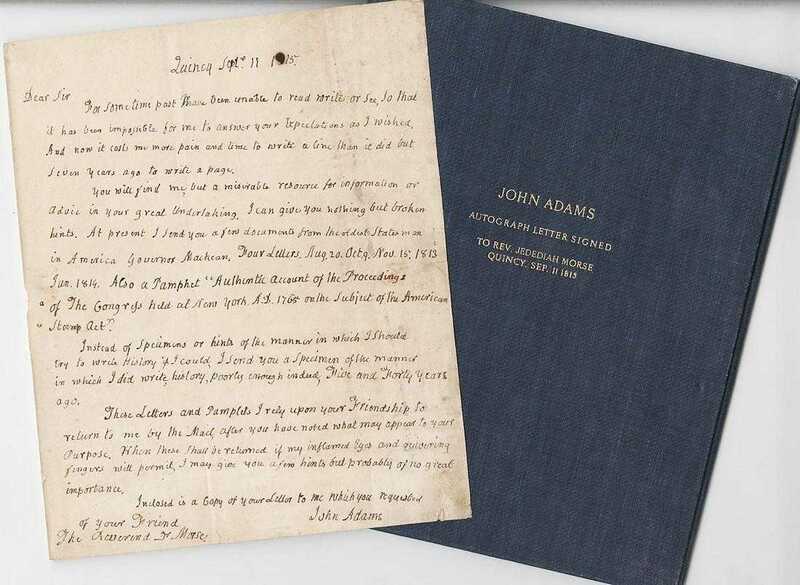 Letter written and signed by John Adams regarding the 1765 Stamp Act of Congress, to Jedidiah Morse for his Annals of the American Revolution, dated Sept. 11, 1815 (est. $10,000-$12,000). 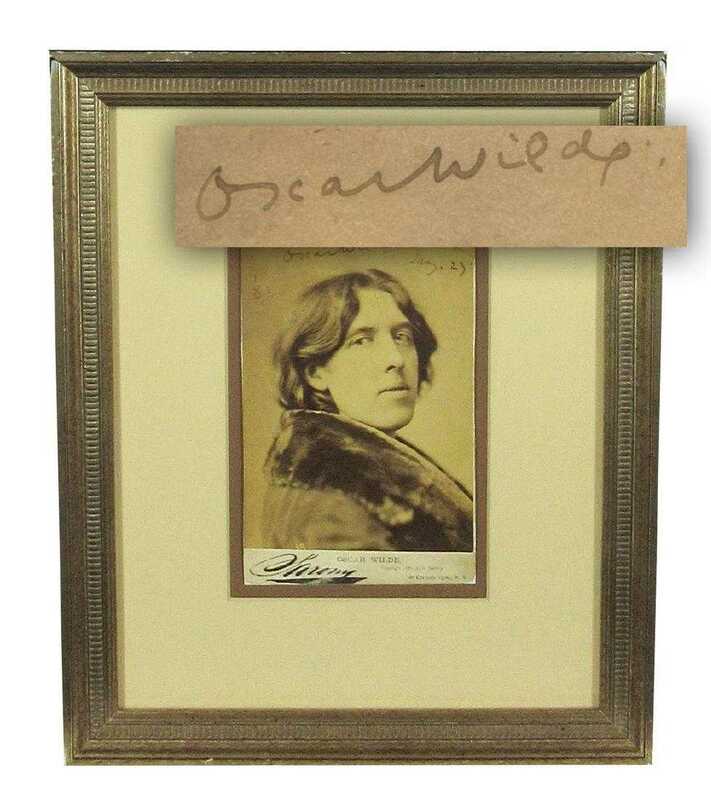 A sepia tone bust portrait photograph of Irish author Oscar Wilde (1854-1900), signed as “Oscar Wilde” and dated “Jany. 23 ‘82”, depicting the long-locked dramatist in an overcoat with a wide fur collar, carries an estimate of $6,000-$7,000. Also, a two-page letter beautifully handwritten in French by the Russian Empress Alexandra Feodorovna, World War I-dated in January 1915 and signed (as “Alexandra”), with mention of the French Red Cross, should bring $2,400-$2,600. Sepia tone bust portrait photograph of Irish author Oscar Wilde (1854-1900), in an overcoat with a wide fur collar, signed as “Oscar Wilde” and dated “Jany. 23 ‘82” (est. $6,000-$7,000). A small archive of autograph letter drafts, notes and documents pertaining to Lenny Bruce (1925-1966), revealing the business and personal side of the controversial comic, six pieces total, some inscribed and signed, has an estimate of $2,400-$2,600. Also, a check signed by baseball great Jackie Robinson (as “Jack R. Robinson”), in the amount of $6.50 and made out to the “Cinderella Ball Committee”, framed with a photo of Robinson at bat, should garner $700-$800. Rare formal portrait photograph of renowned scientist Marie Curie, shown seated in a chair, signed on the mount as “M. Curie” and dated “November 8, 1929”, framed (est. $6,000-$6,500). Lots pertaining to renowned French scientists Pierre and Marie Curie are expected to attract keen bidder interest. They include a one-page letter written in French by Pierre Curie, signed and dated April 7, 1905, addressed to the Royal Society of Surgery and Medicine, with his photo (est. 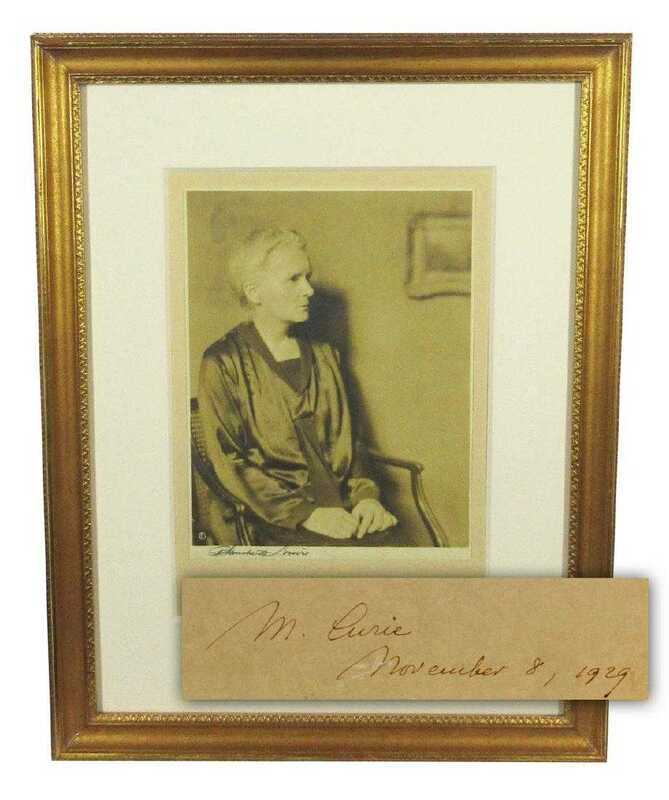 $7,000-$8,000); and a rare formal portrait photograph of Marie Curie, shown seated in a chair, signed on the mount as “M. Curie” and dated “November 8, 1929”, framed (est. $6,000-$6,500). A single-page typed letter, signed by Walt Disney and dated Jan. 23, 1942, in which Disney discourses on what his studio can and can’t do to support the war effort in the aftermath of Pearl Harbor, has an estimate of $3,000-$3,500. Also, a five-page letter, handwritten by Vivien Leigh and dated “Dec. 10th” (presumed to be 1939), to her agent, John Gliddon, regarding her fears of having to attend the opening of Gone with the Wind in Atlanta, should sell for $1,500-$1,700.